"Dry Rot," acrylic, 20"x30", Dean Mitchell. "I Am Joseph Northern," watercolor, 20"x30", Dean Mitchell. "Napping Coachman," acrylic, 11.25"x10", Dean Mitchell. "Rotting in the Light," 18"x19", Dean Mitchell. 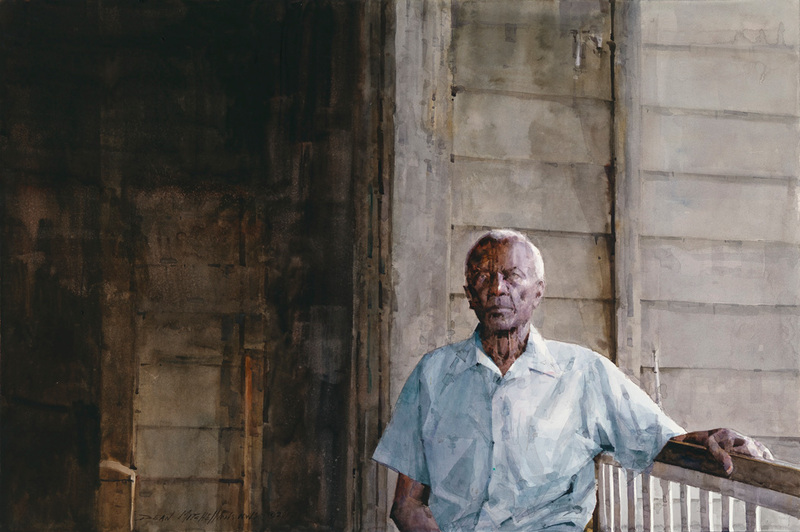 In his current show at the EthnicArt Gallery, Dean Mitchell captures the angst, dignity, and strength that often define a life lived in poverty. Mitchell, an African American artist who experienced poverty first hand as a child, takes on this tough subject in more than two dozen oil, acrylic, and watercolor paintings created between 2012 and 2018. “I grew up poor and I think it’s a huge conversation to have about quality of life. Poverty influences education, self-esteem, and way of life. A lot of people have dignity and pride but can’t emerge out of those spaces. I’m trying to show they’re trapped in some ways, yet there is an inner strength and dignity,” Mitchell says. Born in Pittsburg, Pennsylvania, Mitchell was raised by his grandmother in Quincy, Florida, and her encouragement was key in his choice to pursue life as an artist. Over a prolific career that has spanned four decades, Mitchell has won more than 600 awards, including the T.H. Saunders International Artists in Watercolor Competition and the American Watercolor Society’s Gold and Silver Medals. His work is held in private and public collections internationally and regionally, including the Nelson-Atkins Museum of Art, the Kemper Museum of Contemporary Art, and the Nerman Museum of Contemporary Art. He was also one of four artists considered for President Barack Obama’s official National Gallery portrait. Mitchell masterfully appropriates an array of creative tools and techniques to communicate his message. Positive and negative space, along with horizontal and vertical planes, find a shared equilibrium in his paintings and contribute to a sense of harmonious balance in his work. 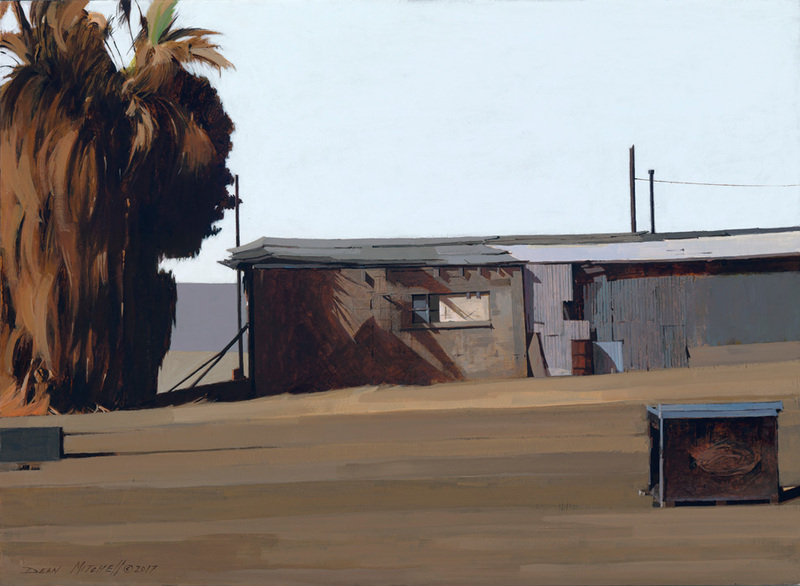 Dominated by urban or rural structures, Mitchell’s subjects include areas where scarcity and isolation circumscribe the space, and poverty traverses every inch and moment. “Out of Service,” “Dry Rot,” and “Rotting in the Light” are compelling examples of this hard-edged world that can engender hopelessness and despair. Whether the medium is watercolor, acrylic, or oil, Mitchell has adopted a palette of warm neutrals for most of his works, opting for just a few stanzas of vibrant color. Mitchell’s subtle transitions within this neutral palette, seamlessly interwoven with elements of abstraction and impressionism, undergird the depictions of his subjects. An admirer of da Vinci, Mitchell has been influenced by the master’s chiaroscuro technique and, regardless of the medium, Mitchells’ own work radiates with exquisitely articulated light. Watercolor is Mitchell’s main avenue of expression, and he relies on his mastery of the medium to further convey his deep-rooted message. 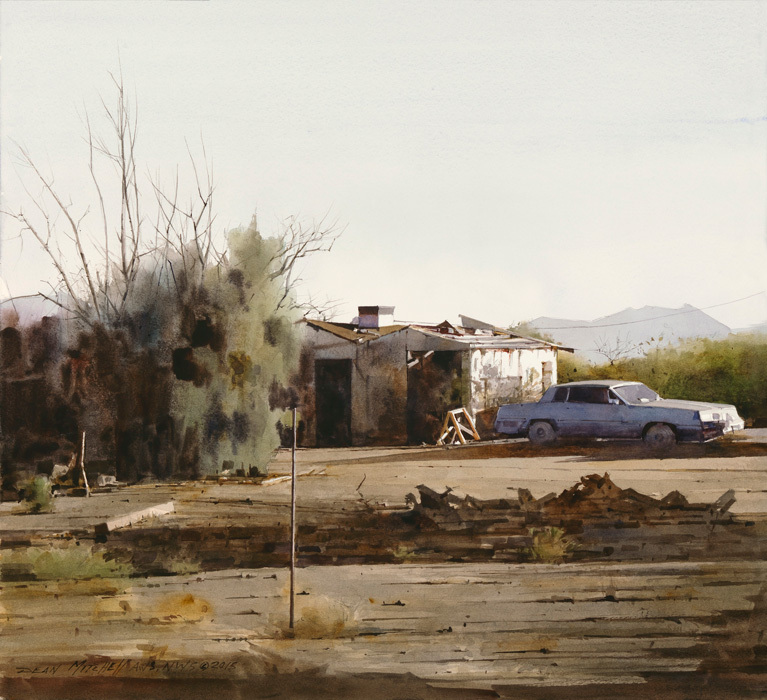 “Transparent watercolor, which is known as an unforgiving medium, is the largest body of my work and speaks to the unforgiving disenfranchisement of the images I paint in American culture,” he says. Works in which human subjects are present— there is often only one — underscore his message about the sequestering effects of poverty. Searching for answers, his contemplative subjects look quietly into the distance. 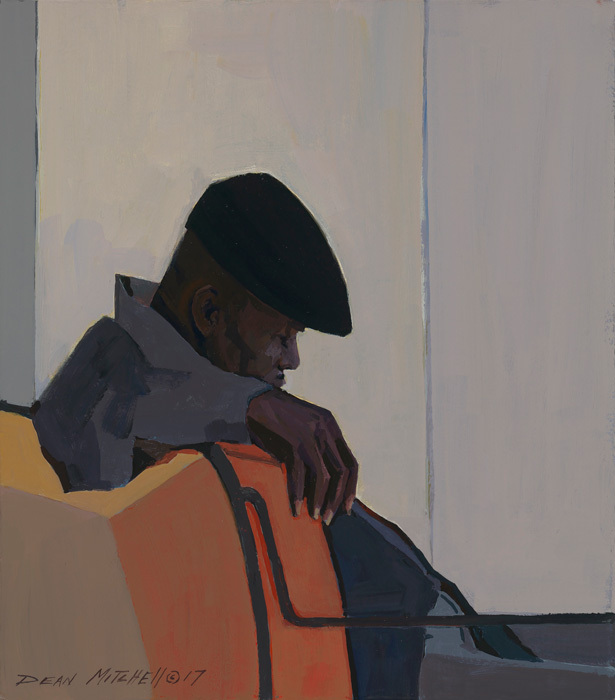 In their silent poise and presence, “Napping Coachman” and “I am Joseph Northern,” speak volumes about their lives through nuances of expression, gesture, and posture. Previous Post All Musicians on Deck! Anne Marie, you were able to capture in words what, I think Dean Mitchell is currently conveying through his art. Thank you for your observations and superb writing skills.